Top Line Conditioning Cubes deserve their reputation as the most popular and effective fully balanced conditioning feed on the market. 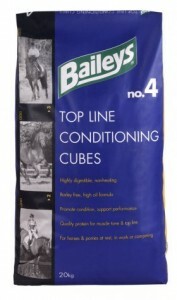 Barley-free and based on micronised wheat, the cubes are non-heating and highly digestible and are renowned for restoring lost condition without blowing horses’ minds. They provide excellent quality protein, which is vital for developing muscle tone and real top line, as well as soya oil for coat condition and as an additional source of slow release energy. Their effectiveness means that weight gain can be promoted without having to resort to excessive volumes of hard feed, helping to avoid the associated digestive risks. With a superior vitamin and mineral profile, including chelated (Bioplex®) minerals, Top Line Conditioning Cubes are incredibly versatile and can be fed to all types of horses and ponies at rest, in work or competing up to the highest levels. Indeed they are now well established as a favourite amongst competition riders who appreciate the excellent muscle tone and improved stamina they promote. Their digestibility also makes them an excellent choice for the older equine, especially those with poor dentition since they can be easily softened with warm water or soaked sugar beet pulp.